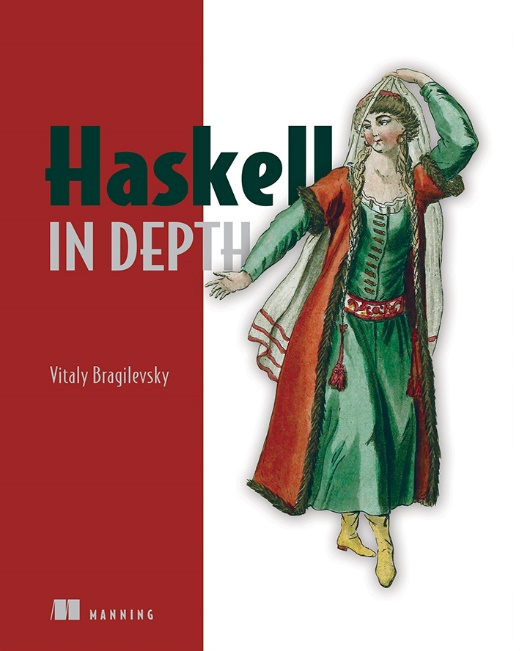 Take 37% off Haskell in Depth. Just enter fccbragilevsky into the discount code box at checkout at manning.com. Extract all words from the given text file and print them. Count the size of the vocabulary. Find the most frequently used words. Such a program could be part of a larger social media text analyzer, which could be used to mine various pieces of information (ranging from level of education or social position to the risk of financial default) by analyzing the texts people post on their social media pages. Or, more likely, you’ve gotten up in the middle of the night with a desire to explore the size of Shakespeare’s vocabulary. How many different words did Shakespeare use in Hamlet? ghci> text <- readFile "texts/hamlet.txt"
This is better, although looking at the other words in the resulting list, ws, reveals that this isn’t a correct way to clean words: for example, it’s removed all hyphenated words (due to takeWhile isLetter). Prelude> :set prompt "ghci> "
Alternatively, you can tweak your .ghci file to make this change permanent. The GHC User Guide gives you more details about the location of .ghci file: you can write any GHCi command there; for example, defining values, importing modules, or executing some Haskell code. The REPL approach to solving problems quickly gets clumsy; let’s try to write a complete program to solve the same problem—extracting a vocabulary (a list of used words) from the given text file and computing the size of the vocabulary. In this attempt we’ll also switch to the Data.Text datatype, which is much more suitable for handling textual data in terms of both performance and convenience. The resulting program is presented in the following listing. Now you can read the filename from the command line without worrying too much about incorrect user input. This is done in the first line of the main function. The modules Data.Text and Data.Text.IO are usually imported with qualifiers to avoid name clashes with Prelude (the module which is imported by default). They come with the text package, which should be installed prior to compiling this program (although it may be installed already, depending on your GHC distribution). The function toCaseFold converts the whole Text value to folded case, and does it significantly faster (and in a more correct way) than mapping with toLower over every character. The function dropAround removes leading and trailing characters that satisfy the given predicate (the function of type Char → Bool). described, together with other functions for cleaning texts. You can also Google what you need, but adding the “hackage” or “stackoverflow haskell” keywords to your search query usually leads to much more relevant results. We won’t attempt to make the cleaning results better, because the main goal of this chapter is to discuss structuring functional programs. In fact, breaking text on words can’t be done reliably without diving deep into the Unicode rules on text boundary positions. If you’re interested, look at the documentation for the module Data.Text.ICU from the text-icu package; you’ll find fascinating details there on what a word is. Even then, you need to add some sort of semantic analysis to come up with a bulletproof solution that works beyond the English language. Don’t forget to check your own solution with several text files. But there’s more than that in this outline: we plan to read and process command-line arguments (the name of the file, which is a variable of type FilePath) in the main function, and, if this is done correctly, proceed with processing the text file (using processTextFile). This function reads the content of the given file (this is the second component of the user input in this program, after the command-line arguments) into a variable of type Text, extract the vocabulary (with the extractVocab function), and finally print it (with printAllWords). Note the function extractVocab: it’s the only pure function in this program. We can see that from its type, T.Text → Vocabulary—there’s no IO there. You can see this scenario visualized in the flowchart depicted in figure 1. I’ve tried to present all the components of the program there: user input, actions in the I/O part of the program, and their relations with the pure functions. 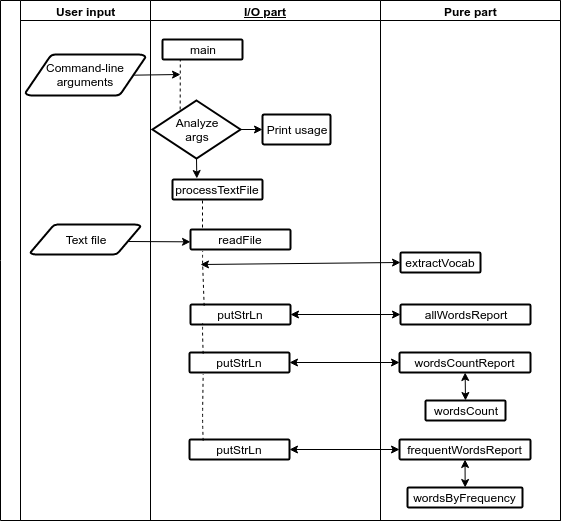 Arrows in this flowchart represent moving data between the user and the program, and between functions within the program. _ -> putStrLn "Usage: vocab-builder filename"
Unfortunately, there’s a problem with this approach: we tend to stick with IO, and almost every function in the program is an I/O action. Next, I’ll show you how to do the same task in a completely different way. The problem with functions like printAllWords, printWordsCount, or printFrequentWords is that they are too tightly and unnecessarily coupled with I/O. Even their own names suggest that the same functionality can be achieved by combining the impure print with pure computations. It’s generally agreed within the Haskell community that we can get the most out of the advantages of functional programming when we use pure functions as much as possible: they’re easier to combine with other functions, they can’t break something in other parts of the program, and we can even reason about their correctness. Let’s try to follow the path of purity as we solve our main problem in this section—extracting a vocabulary—to see how pure functions allow us to extend the functionality of the program easily. Extract the vocabulary of a text file. Print all words used in the text. Count and print the number of different words. Find the specified number of the most frequently used words. 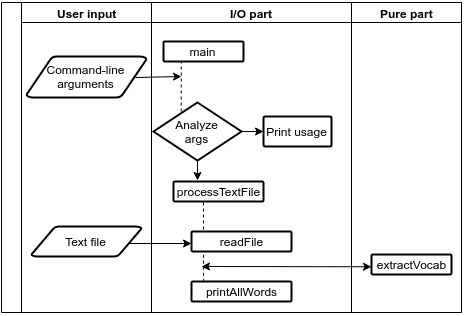 The functions in the I/O part of the program (IO-actions) now become more trivial: the goal of processTextFile is reading the text file, calling extractVocab to extract the vocabulary, and printing the results of all the *Report functions. The complete flowchart is depicted in figure 2. Nothing new happens when preparing the reports on the list of words used and their counts, but dealing with frequently occurring words is more interesting. Let’s discuss that now. Is this useful in practice? The function wordsByFrequency can be used later—its goal is to sort the vocabulary by number of occurrences of each word—but the goal of frequentWordsReport is only to prepare the report for printing. It isn’t a good idea to add the Int argument to wordsByFrequency, because this greatly limits its potential for reuse. Note also that calling the snd function over the vocabulary entry enables you to compare numbers of occurrences instead of words. https://ro-che.info/articles/2016-04-02-descending-sort-haskell. This post explores the behavior of sortBy and compares it with the other sorting functions, such as sortOn and sortWith. frequentWordsReport vocab n = T.append "\nFrequent words:\n"
The function T.pack is used here to convert a value (not a literal) of type String to type T.Text. The use of compiler extensions in other programming languages is somewhat controversial. In C or C++, for example, there’s the standard language definition, which is implemented by many different compilers, and there are specific compiler extensions. In Python or Ruby there are no standards, and that means that there are no extensions: there’s only one compiler, and you can legitimately use only what it implements. In Haskell the situation is different: there’s a standard definition (the Haskell 2010 Report is the current version) and only one widely used compiler (the Glasgow Haskell Compiler), which implements many extensions beyond what’s defined in the Haskell Report. It’s generally considered good practice to use these extensions, because this gives the community the experience needed to decide whether to include them in the next standard or, in some cases, to exclude them from the compiler itself. The overall solution is presented in the following listing. It features a LANGUAGE directive in the first line that enables the GHC extension OverloadedStrings in the source code; every other aspect of this code has already been discussed. _ -> putStrLn "Usage: vocab-builder filename number_of_frequent_words"
Preparing reports with this program isn’t particularly impressive: we build them trivially by appending strings.